Why a Koi Fish inspired bottle ? At a time when Japanese sake was delivered in barrels and rice was a valuable commodity, producers did not hesitate to dilute rice alcohol with water before sending them to the stores to maximize profits. And, in turn, sake shops would repeat the same action before selling their stock to consumers. This fraudulent practice was so commonplace that a term was coined to refer to it: kingyo-shu, which means that the sake was so diluted in the water that fish could swim in it. But Imayo Tsukasa, a sake producer for more than 250 years, was never been involved in such practices and has excellent relationships with sake sellers. The brand has decided to create a line of sake inspired by this important episode in the history of the making of this alcohol. 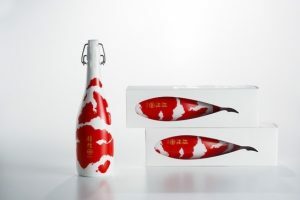 By taking the expression literally, they came up with a Koi-colored bottle and a fish-shaped design that we found very creative, a work owed to graphic designer Aya Codama.